I’ll admit it – I had no idea that any 78s from the country of Suriname existed. It made sense that there were recordings made, and I had some documentation stating that there were recordings of music from British Guiana (now Guyana), but nothing from Suriname – until I came across this rarity. As soon as I started poking around, the label, the artist, and the story behind this fun little record came into focus. Suriname, the smallest country in South America, had been a Dutch colony since the 17th century, when the British famously traded it to the Dutch for the island of Manhattan. Previously, the Arawak and Carib peoples lived in the region. The Dutch brought African slaves to their colonies in Suriname and many escaped, starting their own rural societies away from the Dutch-owned plantations. They became known as the Maroons. In the 19th century immigrants from India, the Dutch East Indies, the Middle East, and China arrived, further diversifying Suriname’s population into one of the most varied in the world. In 1954, Suriname was granted some self-rule, but it wasn’t completely independent until 1975. Edward James “Eddy” Vervuurt was born in Suriname in 1928. By the time he was a teenager, he was studying piano and composition at the Amsterdam conservatory. While in the Netherlands, he formed a band called “Edwardo y su Orquestro Rhytmico.” He returned to Suriname soonafter and had a long career as a composer, bandleader and conductor of the Suriname Philharmonic, as well as the head of the local radio station Radio Apintie. From what I understand, Vervuurt frequently incorporated local, Surinamese folk music into his compositions, and encouraged Surinamese composers to do the same, and to musically embrace their culture. He died in 1988. 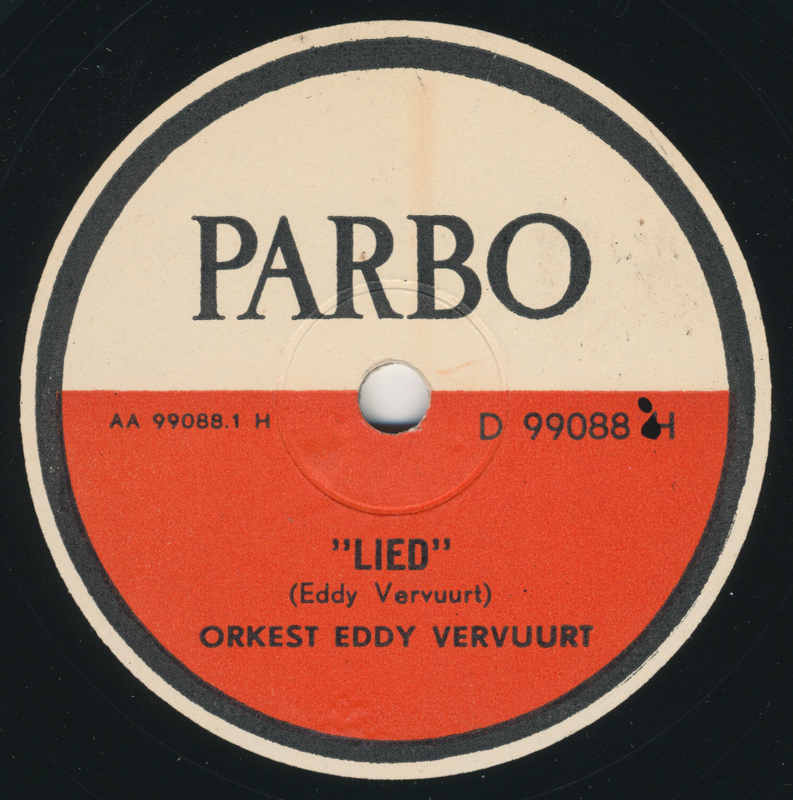 The name of this label – Parbo – has two meanings: it’s a shortened nickname of Paramaribo, the capital of Suriname, and it is the name of a famous Surinamese beer. This record, it turns out, is in fact a promotional record for Parbo Bier, then being brewed at the Amstel factory (and now brewed by Heineken). The song title – “Lied” – simply means “Song” in Dutch. The colors and font on the label are the same as those used for the beer. Eddy Vervuurt, it turns out, was the bandleader for a local group featuring the vocalist “Big Jones” (real name: Marius Liesdek) who was a fisherman and sausage seller by day. According to an article by Joop van Mil, this band cut several records with an Afro-Caribbean feel, in Surinamese styles known as kaseko and kawina. Part of this song appears to be sung in Dutch (the national language of Suriname), although it’s possible (?) that the chorus is in Sranan Tongo, the English-based Creole language which is spoken by a large amount of the country’s population. It’s a wonderful piece – beer-infused or not. The musicians play beautifully and loosely, with Eddy giving himself a piano break that wouldn’t sound out of place on a Les Baxter album! parbo bier is lekker bier, parbo bier is beter bier, in english parbo beer is tasty ber , parbo beer is better beer. the Sranan text i do not understand. Is there a change to hear the b-side of this one? Sounds like the background voices are singing in Dutch, and the lead vocalist is singing in Sranan…? Thanks a lot for the impressive record.Not only the record but the related information is also equally interesting.Thanks a lot for the great job. he sings: parbo beer is better beer. Thanks for all the wonderful music you have posted. I really enjoyed your appearance on WFMU – informative and endlessly interesting – just like this blog:). Terrific stuff. Thanks for sharing these gems! Some more info on the singer. He released 2 four song singles and he can be seen live on this clip from the documantary I posted on my Youtube account. this song is on one of the 2 singles released. Thanks so much. This song takes me waaaay back into my youth. Nice to find it here. if you have more music to share from Eddy Vervuurt (he penned some waltzes/piano intrumentals too, probably released on 78 also I think), or by Lex Ver4vuurt that would be great. I’ve been looking for them for decades now. Seemed they have disappeared altogether, unfortunately.